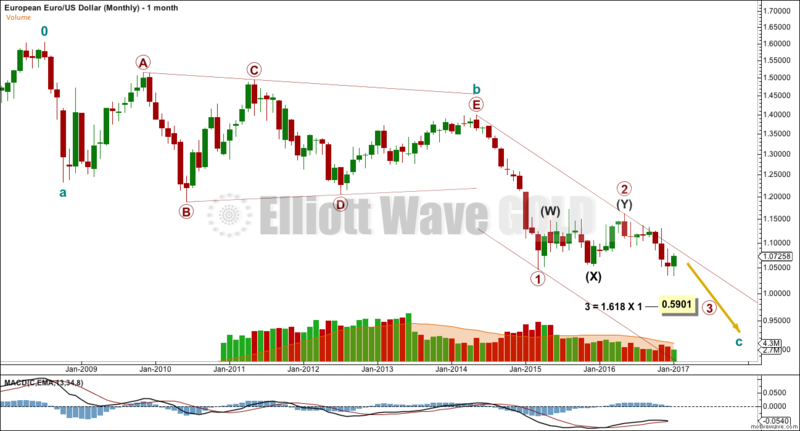 Last Elliott wave analysis of this pair (22 February 2019) expected some upwards movement. Price has moved upwards, giving confidence to the current Elliott wave count. Summary: Upwards movement for another two or so months to 1.2046 – 1.20761 is expected. Changes to this analysis are in bold. The (0) is from where the wave count begins. A large zigzag can be seen complete at the low in March 2015. 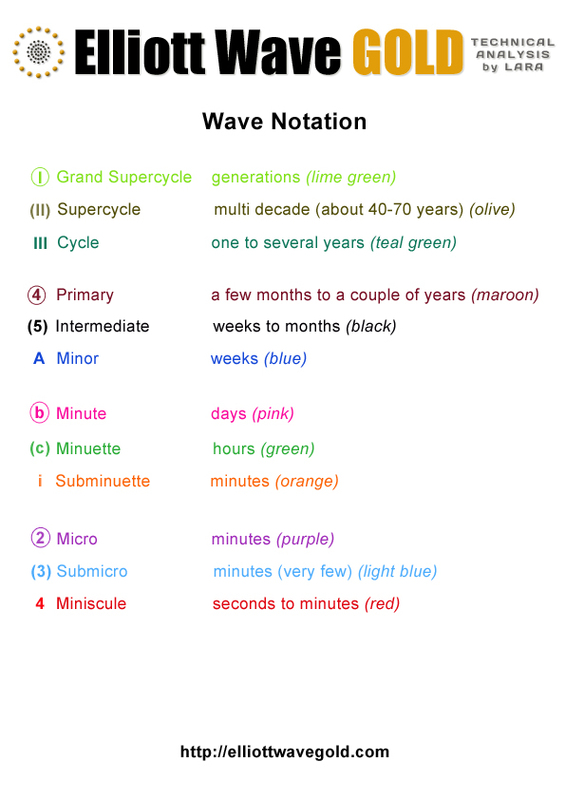 This is labelled Super Cycle wave (w). A low now below this point indicates that the larger structure downwards is incomplete. 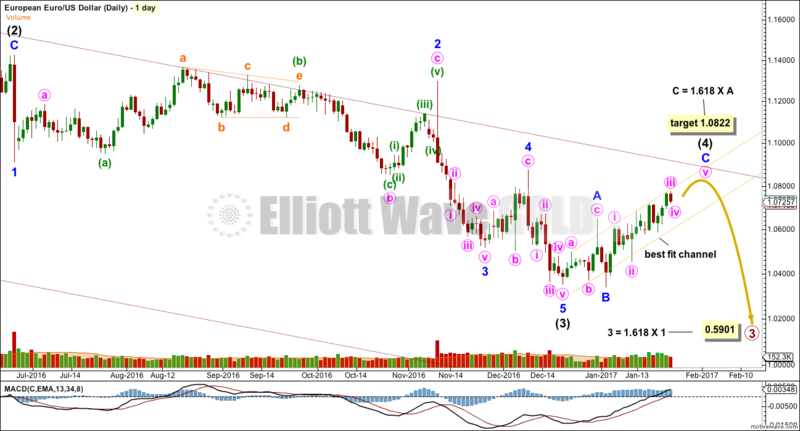 The Elliott wave structure that fits best here is a double zigzag. The first zigzag in the double is complete; it is labelled Super Cycle wave (w). The double is now joined by a complete three in the opposite direction, an expanded flat labelled Super Cycle wave (x). Because Super Cycle wave (x) ends just short of the cyan bear market trend line, it looks like it is over there. Super Cycle wave (y) is most likely now to unfold as a zigzag. While double zigzags and double combinations are labelled the same, W-X-Y, they are very different structures. Double zigzags, like single zigzags, normally have a strong counter trend slope. To achieve this their X waves are usually brief and shallow. The second zigzag in the double usually moves reasonably beyond the end of the first zigzag, so that the whole structure has a strong slope. Double combinations are sideways movements. To achieve a sideways look their X waves are usually deep and can also often be time consuming. The second structure in the double usually ends about the same level as the first, so that the whole structure takes up time and moves price sideways. Here, Super Cycle wave (x) is relatively shallow. This indicates a double zigzag is most likely unfolding lower. The bear market trend line may be expected to continue to provide resistance while the bear market for EURUSD remains intact. The strongest piece of technical analysis on this chart is the cyan trend line. The fact that it was tested and recently held in February 2018 indicates this line has strength. Any strong bounces within the ongoing bear market may be expected to find strong resistance at this trend line. Primary wave 1 subdivides as an impulse. Primary wave 2 may be unfolding as an expanded flat correction. Within primary wave 2, intermediate waves (A) and (B) both subdivide as a zigzags. Intermediate wave (C) should subdivide as a five wave structure. The most common Fibonacci ratio is used to calculate a target at intermediate degree for intermediate wave (C) to end. This is very close to the 0.618 Fibonacci ratio of primary wave 1. If primary wave 2 moves above the target or is long lasting enough, it should find strong resistance at the cyan trend line that is copied over from the monthly chart. 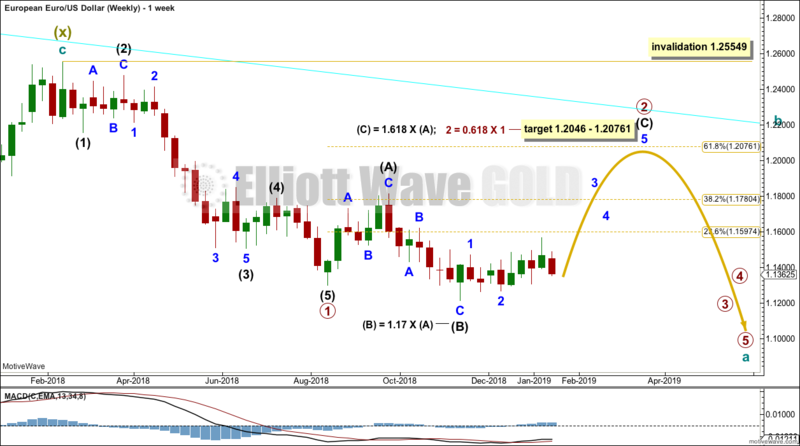 This daily chart focusses on the structure of primary wave 2. This wave count considers intermediate wave (C) as an incomplete impulse. Within intermediate wave (C), minor wave 2 may be a complete combination with minute W subdividing as a zigzag and minute Y subdividing as an expanded flat. Within minute Y, minuette (b) has subdivided as a zigzag and minuette (c) as an impulse. Upwards movement is expected as minor wave 3 begins. Elliott wave rules state that the third wave within an impulse must subdivide as an impulse, so minor wave 3 must subdivide as an impulse. Within minor wave 3, minute waves i and ii may be complete with minute wave iii unfolding as an incomplete impulse. Minor wave 3 breaking out above the adjusted base channel would help confirm that a third wave is underway and thus increase confidence in the current Elliott wave count. If minute wave ii continues lower, it may not move beyond the start of minute wave i below 1.12340. Price is currently range bound and swinging from resistance at about 1.155 to support at about 1.130. 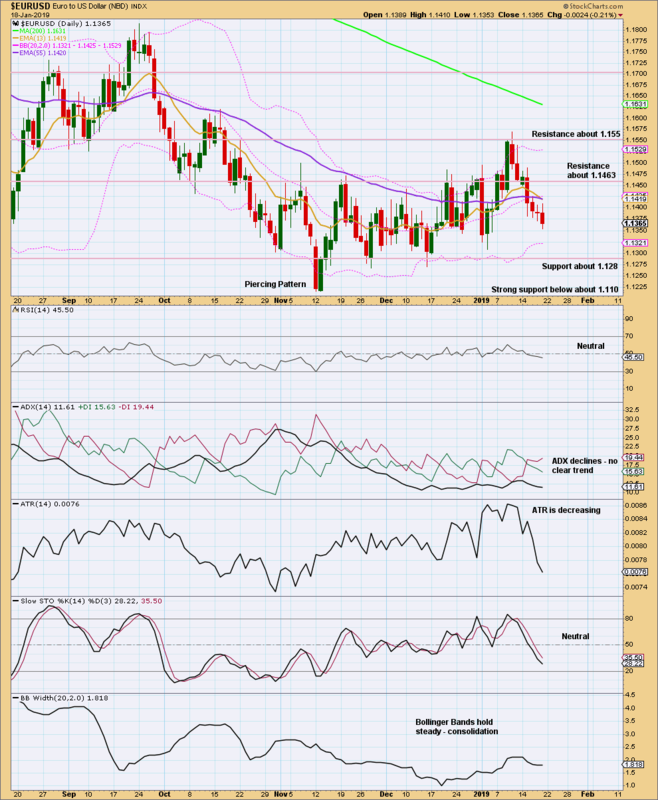 ADX supports the view that the market is consolidating. A break out above resistance or support is needed to indicate a new trend. RSI is neutral. There is room for price to rise or fall. 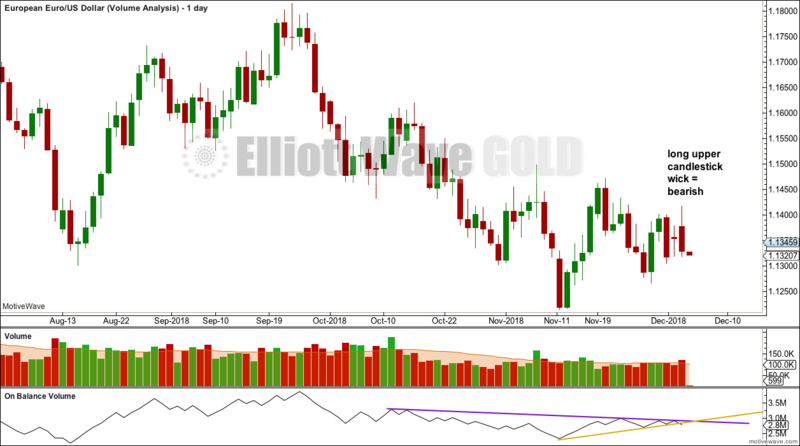 On 16th February 2019, as price broke below support, stochastics entered oversold. Expect upwards movement from here as price swings high to resistance. 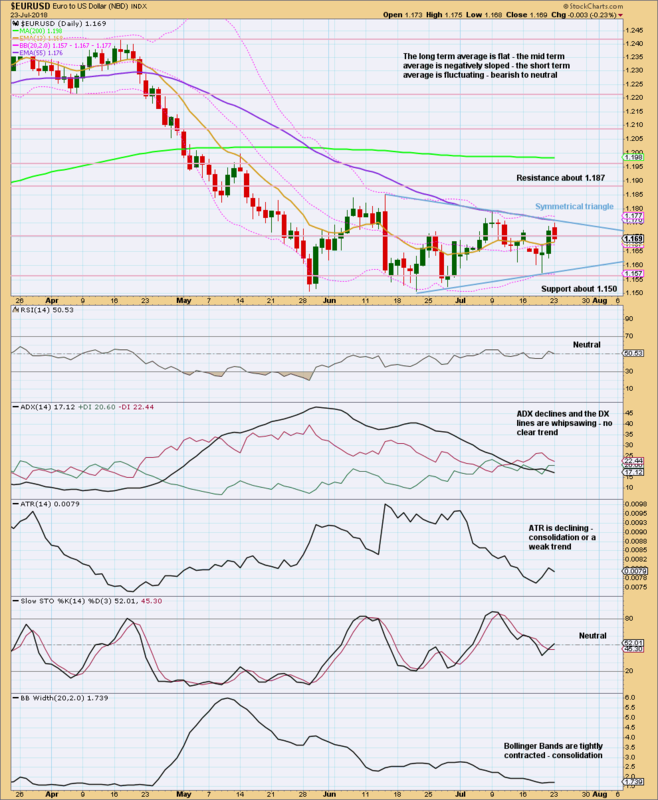 Stochastics often enters overbought as price nears resistance. Expect some upwards movement as price rises to resistance. On Balance Volume is range bound and gives no signal for this week. Volume offers more support for recent upwards days. Overall, this chart is bullish. Published @ 02:03 a.m. EST on March 3, 2019. Careful risk management protects your trading account(s). 1. Always trade with stops. 2. Risk only 1-5% of equity on any one trade. 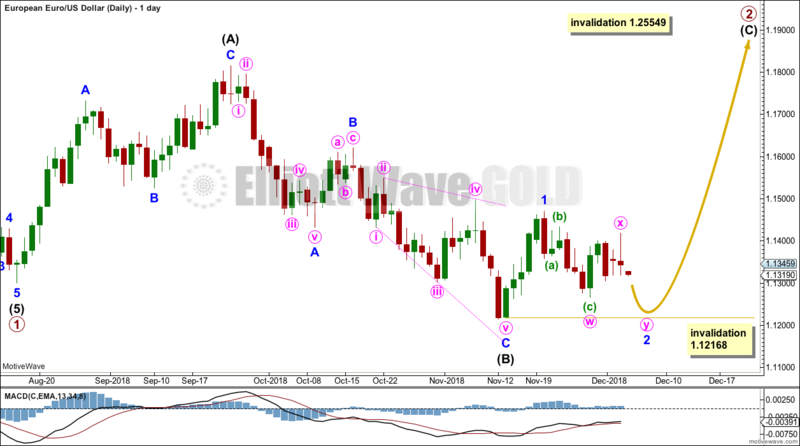 Last Elliott wave analysis of this pair (18 January 2019) expected some upwards movement. Again, price has again mostly moved sideways. 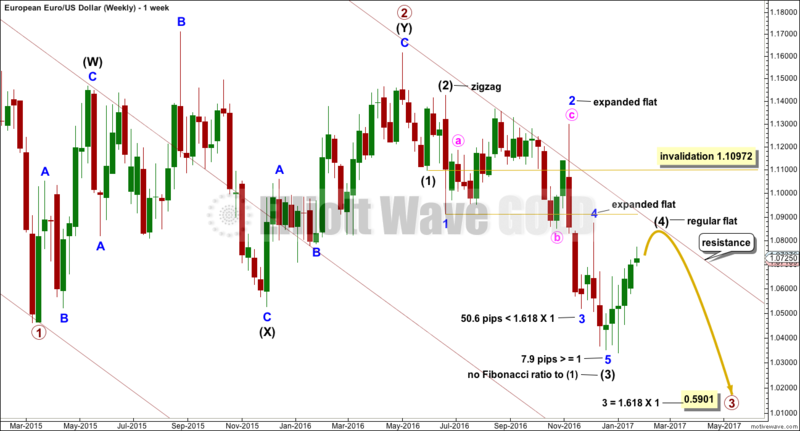 This wave count considers intermediate wave (C) as an incomplete impulse. Within intermediate wave (C), minor wave 2 may be a combination with minute W subdividing as a zigzag and minute Y subdividing as an expanded flat. Within minute Y, minuette (b) has subdivided as a zigzag and minuette (c) as an impulse. Upwards movement is expected as minor wave 3 begins. Minor wave (ii), if it moves any lower, may not move beyond the start of minor wave (i) below 1.12168. On Balance Volume has broken below support. This is a bearish signal. Published @ 12:26 a.m. EST on February 25, 2019. Last Elliott wave analysis of this pair (December 12th, 2018) expected some upwards movement. Price has again mostly moved sideways but with an upwards bias. This wave count considers intermediate wave (C) as an incomplete impulse. Within intermediate wave (C), minor wave 2 may be a combination with minute W subdividing as a zigzag and minute Y subdividing as an expanded flat. Minor wave 3 is incomplete and needs to subdivide as an impulse to meet Elliott Wave rules. 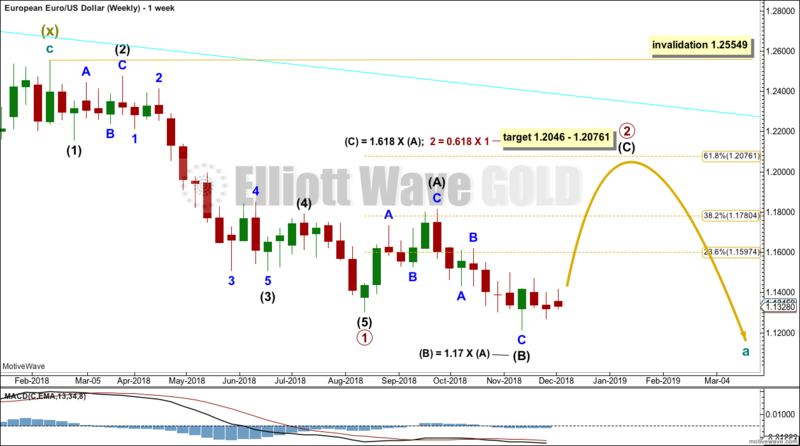 Minuette wave (ii) may not move beyond the start of minuette wave (i) below 1.13093. This alternate wave count considers intermediate wave (C) as an incomplete ending diagonal. All sub waves within an ending diagonal should subdivide as zigzags. 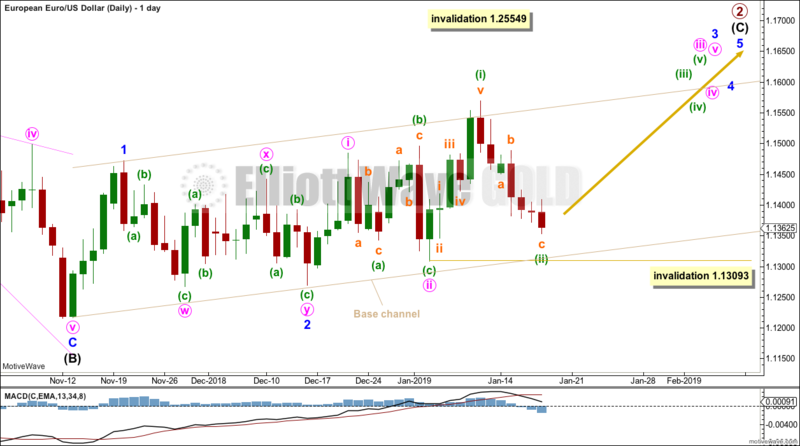 A zigzag for minor wave 1 may be complete at the last high of 1.5695. 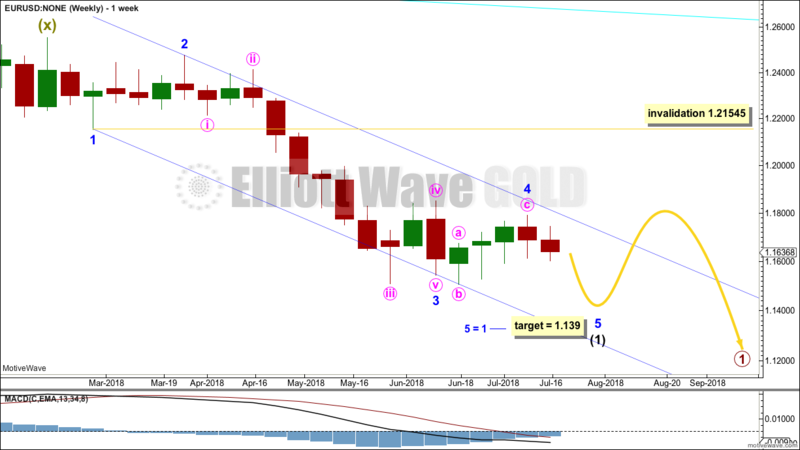 Using the Elliott Wave guideline, wave 2 of a diagonal most commonly retraces 0.66 to 0.81 of the preceding wave, a target zone between 1.3367 and 1.2828 may be calculated. Price is falling with declining volume and ATR, which shows weakness in the downwards movement. This supports the main Elliott Wave count. Expect price to move lower to support. During a consolidating market, support or resistance may be overshot only for price to then turn around and return to within the consolidation zone. When price reaches support and Stochastics is oversold, then a downwards swing may be complete. Do not expect price to move in a straight line. Price is falling of its own weight. On Balance Volume has broken below support, which is a bearish signal. This may be a small indication that price will continue to move downwards, which offers some support for the alternative Elliott Wave count. Published @ 05:21 p.m. EST on January 20, 2019. 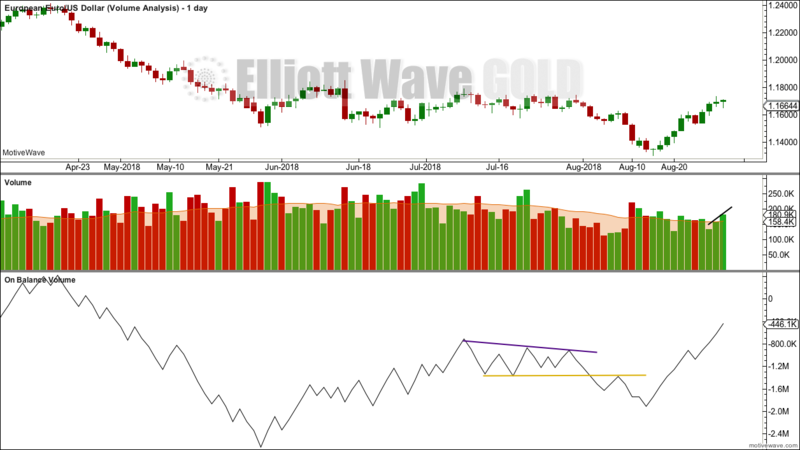 Last Elliott wave analysis of this pair (December 5th, 2018) expected some upwards movement but price has again mostly moved sideways. Primary wave 2 may be unfolding as an expanded flat correction. Within primary wave 2, intermediate wave (A) subdivides as a double zigzag and intermediate wave (B) subdivides as a single zigzag. Intermediate wave (C) should subdivide as a five wave structure. Intermediate wave (C) must subdivide as a five wave structure. Within intermediate wave (C), minor wave 1 may be complete. Minor wave 2 may be a complete zigzag. If it continues further, minor wave 2 may not move beyond the start of minor wave 1 below 1.12168. Currently, price is within a smaller consolidation with resistance about 1.146 and support about 1.128. It is an upwards day during this smaller consolidation that has strongest volume suggesting an upwards breakout may be more likely than downwards. 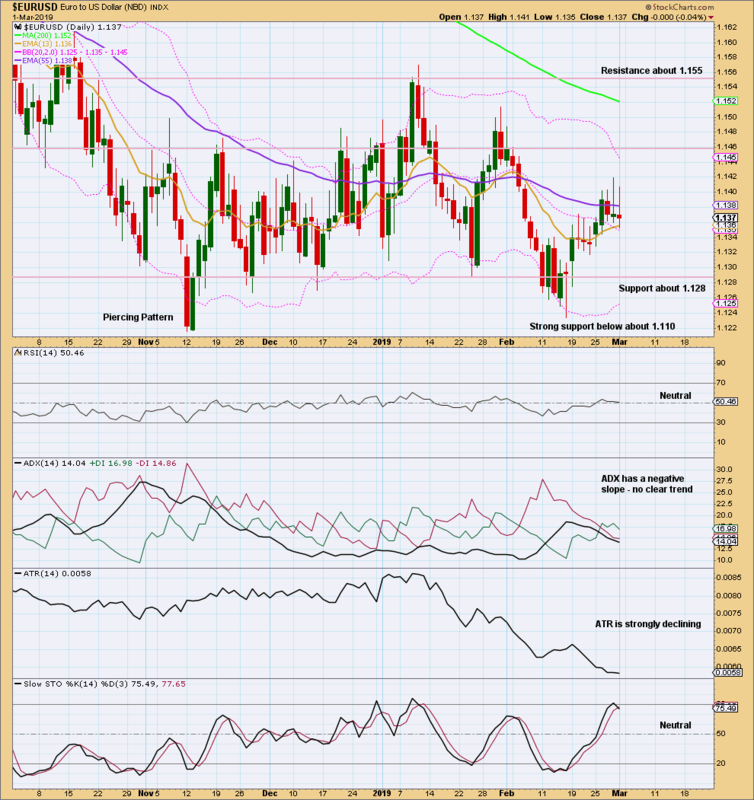 For the very short term, expect a little more downward movement to support. Sideways movement since the last low on the 12th November has the strongest volume for an upwards day on the 15th of November. This suggests an upwards breakout is more likely. On Balance Volume is constrained. Watch it closely as it may give a signal in the next few days. Published @ 01:05 a.m. EST. 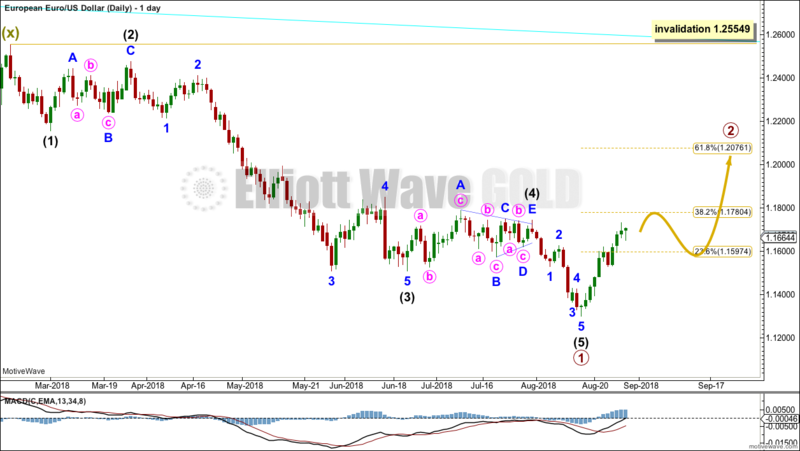 Last Elliott wave analysis of this pair (August 2018) expected some upwards movement but price has mostly moved sideways. Primary wave 2 may be unfolding as an expanded flat correction. Within primary wave 2, intermediate waves (A) and (B) both subdivide as zigzags. Intermediate wave (C) should subdivide as a five wave structure. Minor wave 2 may be continuing a little lower as a double zigzag. Minor wave 2 may not move beyond the start of minor wave 1 below 1.12168. Price has made a series of lower lows and lower highs since the 24th of September, the definition of a downwards trend. 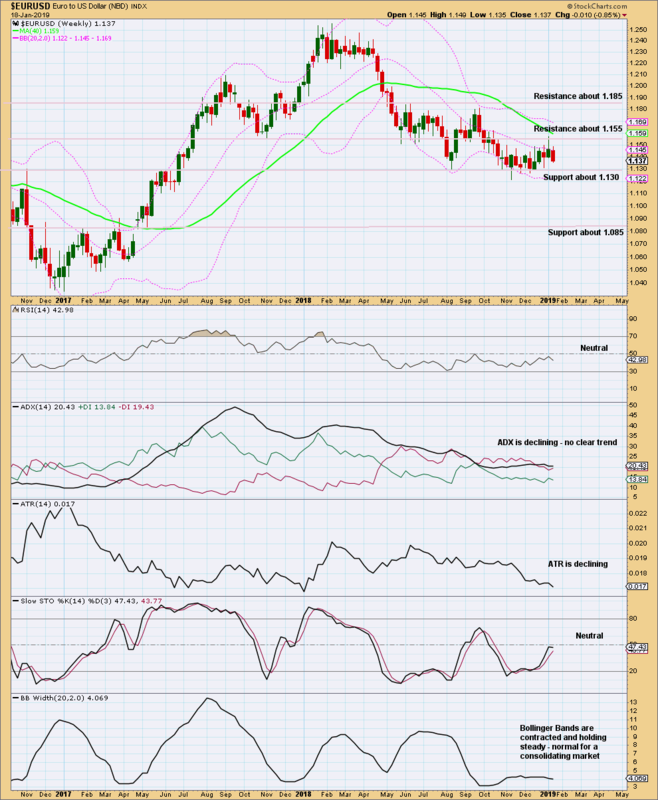 However, ADX does not indicate a trend for the short term. The trend has some weakness as indicated by flat ATR. For the short term, the volume profile is bearish. 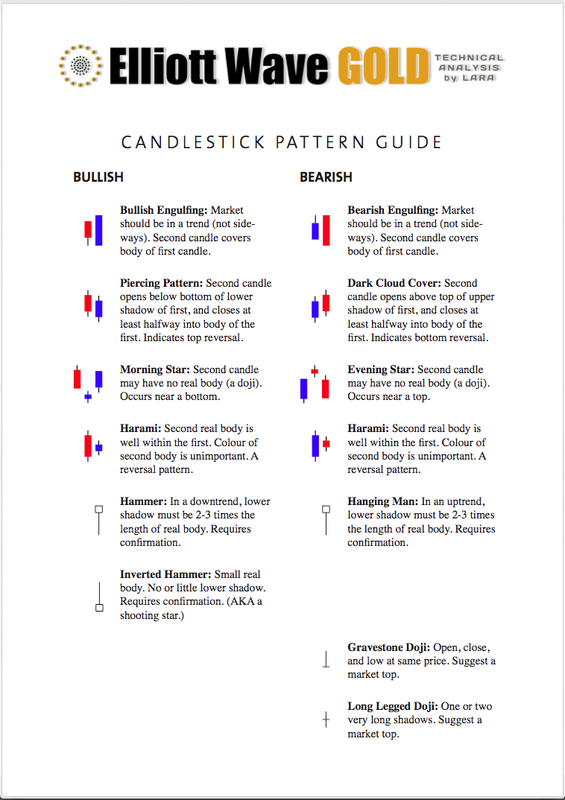 The long upper wick on the last complete daily candlestick is also bearish. 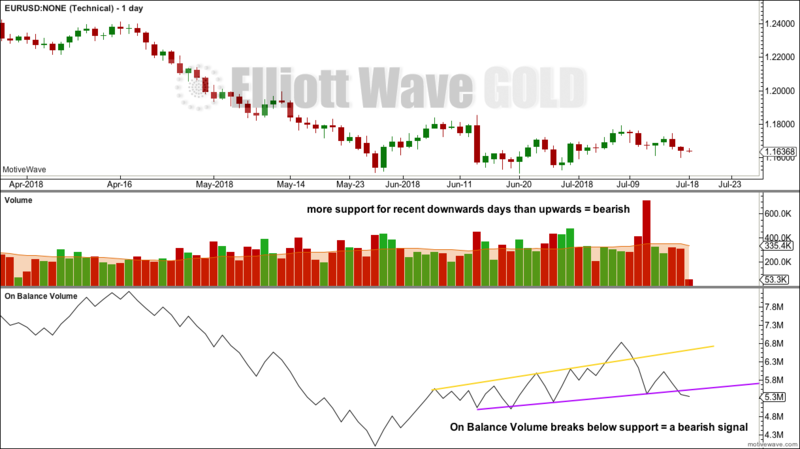 On Balance Volume has breached a short held support line giving a weak bearish signal. Expect at least a little more downwards movement here. Published @ 02:52 a.m. EST. 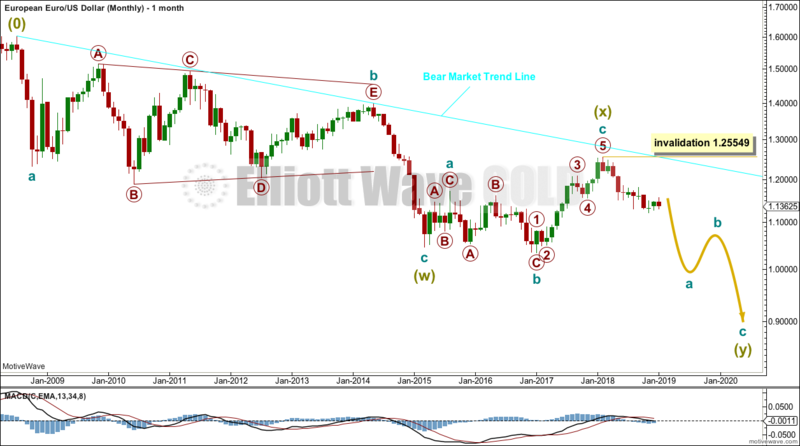 Last Elliott wave analysis of this pair (July 2018) expected more downwards movement, which is what has occurred. Summary: It looks most likely that price may overall rise to about 1.20761 over the next three to eight months. Within the expected rise, there may be a sharp pullback or time consuming sideways consolidation for a B wave. 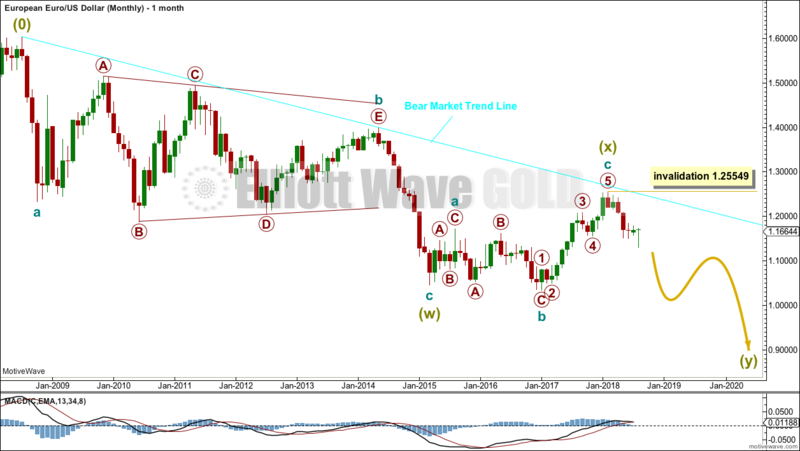 This daily chart focusses on the start of Super Cycle wave (y). A new wave down at Super Cycle degree should begin with a five down. At this stage, that looks to be complete; it is labelled as primary wave 1. Following a five down, a three up should develop. This is labelled primary wave 2. Primary wave 1 lasted six months. Primary wave 2 may be expected to last from at least a Fibonacci three months up to a more likely Fibonacci five or eight months. Primary wave 2 must subdivide as a corrective structure. It would most likely end about the 0.618 Fibonacci ratio of primary wave 1, but it could be deeper than that. The symmetrical triangle noted in last analysis completed and saw a breakout to the downside. At that stage, a target using the measured rule would have been about 1.1278. Price fell short of this target by only 24 pips before turning. Currently, price has reached resistance and Stochastics is overbought. However, Stochastics may remain overbought for some time. 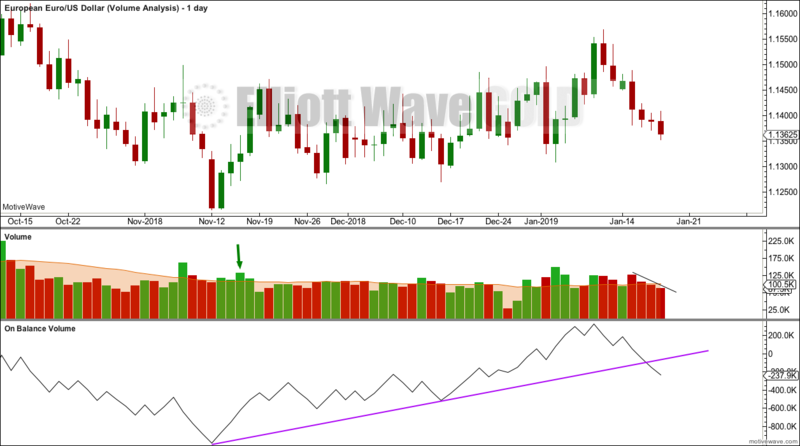 Not until it exhibits bearish divergence with price would a strong warning of a high in place be seen. It looks like a new upwards trend may be developing. 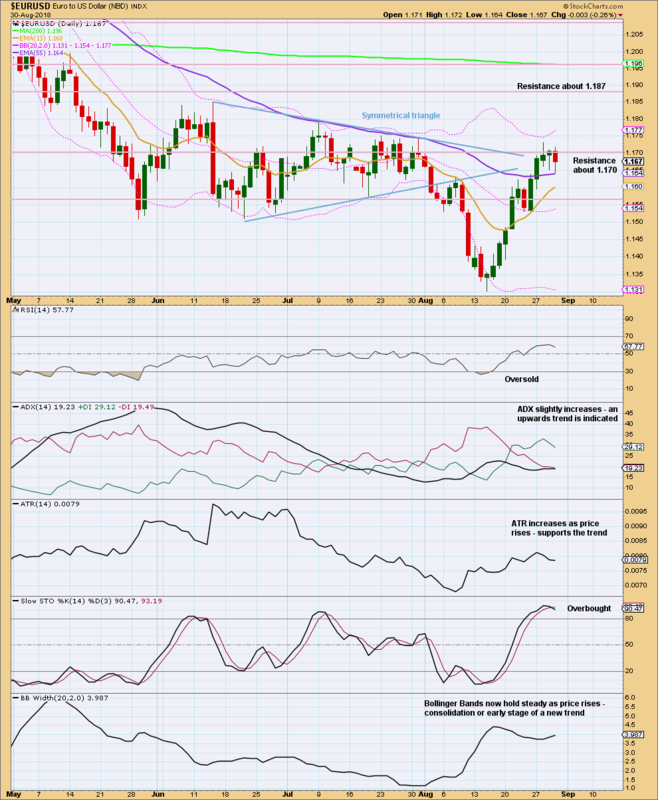 Look for next resistance about 1.187. Overall, this analysis supports the Elliott wave count. For the short term, volume supports upwards movement. On Balance Volume is very bullish. More upwards movement should be expected. 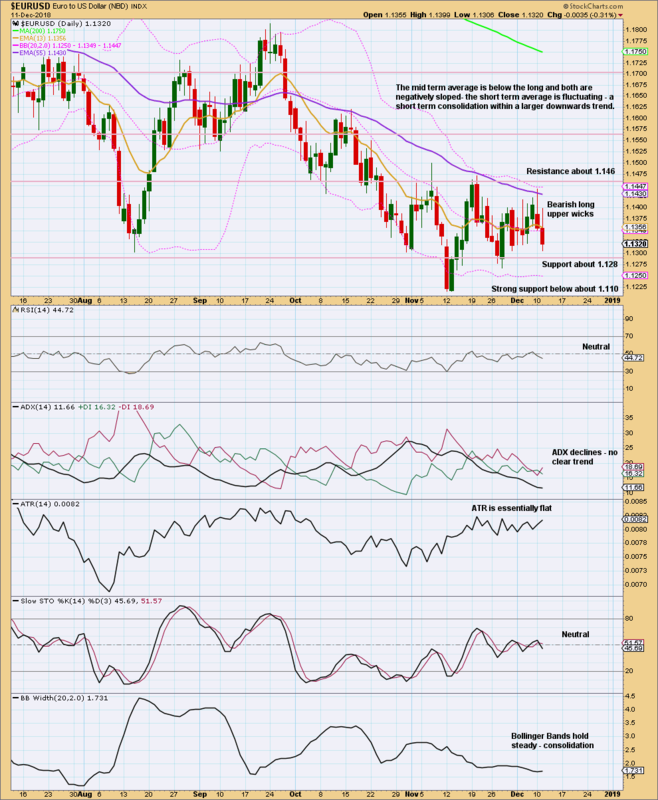 This analysis is published @ 04:56 a.m. EST. Last analysis of this pair was in January 2017. 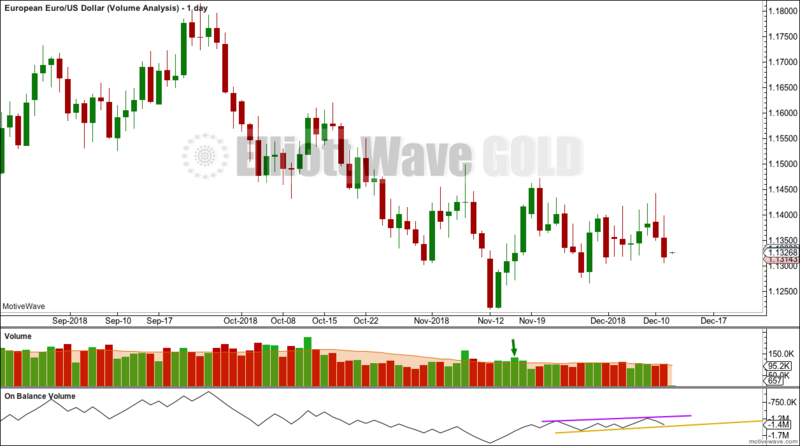 In that analysis members of Elliott Wave Gold were given specific trading advice to either open long positions, or wait patiently. January 2017 was the last major low for this pair. 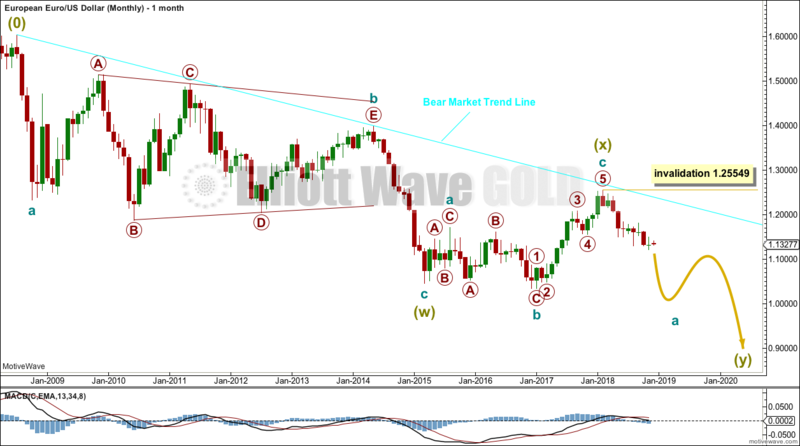 This weekly chart focuses on the start of Super Cycle wave (y). A zigzag for Super Cycle wave (y) would subdivide 5-3-5. Cycle wave a would subdivide as a five wave structure at primary degree. Within cycle wave a, primary wave 1 should last several months. It would most likely be an impulse, and would most likely be incomplete. Within primary wave 1, intermediate wave (1) looks like an almost complete five wave impulse. So far there are no adequate Fibonacci ratios at minor or minute degree within this wave count. Within intermediate wave (1), minor wave 4 may be complete, remaining within the blue Elliott channel. If minor wave 4 is not over there and continues sideways or higher, then it may not move into minor wave 1 price territory above 1.21545. When intermediate wave (1) could be seen as a complete five wave impulse with a new low, then the invalidation point must move up to its start at 1.25556. A larger correction would then be expected for intermediate wave (2), which may not move beyond the start of intermediate wave (1). Minor wave 2 was a single zigzag. Minor wave 4 exhibits alternation as an expanded flat. There is reasonable proportion between these two corrections, giving the wave count the right look at higher time frames. A target is calculated for the end of minor wave 5, which expects it to exhibit the most common Fibonacci ratio to minor wave 1. 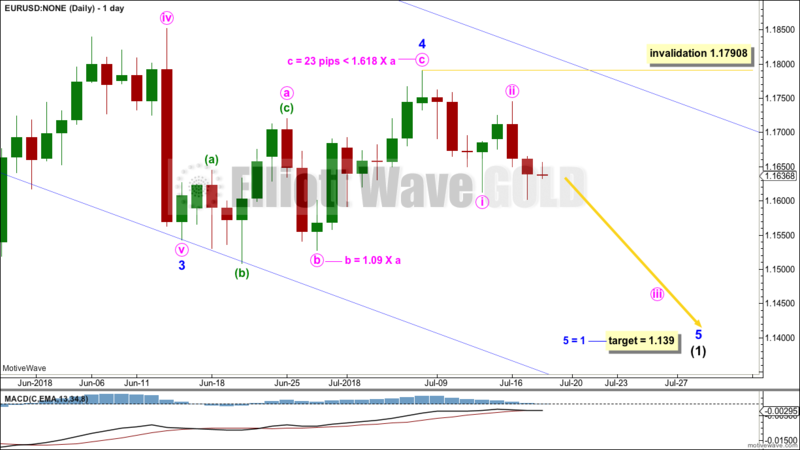 Within minor wave 5, no second wave correction may move beyond the start of its first wave above 1.17908. This allows for the possibility that minute wave ii may not be over and may move higher. The target is expected to be met in one or a very few more weeks. A symmetrical triangle may be unfolding (this is too time consuming to be considered a pennant pattern). Breakouts from symmetrical triangles may be in either direction. During the formation volume is strongest for a downwards day suggesting a downwards breakout may be more likely than upwards. If price breaks out of the triangle on a day with support from volume, then expect the next trend to continue for about the same distance from the breakout point as the widest part of the triangle, which is 342 pips. The prior downwards trend reached very extreme. The symmetrical triangle has allowed extreme conditions to be relieved; there is again room for a trend to develop. Currently, this market is consolidating. Watch the triangle trend lines carefully for a breakout. Volume and On Balance Volume suggest more support for downwards movement than upwards. The next movement out of the symmetrical triangle looks more likely to be downwards. This analysis is published @ 10:27 p.m. EST. 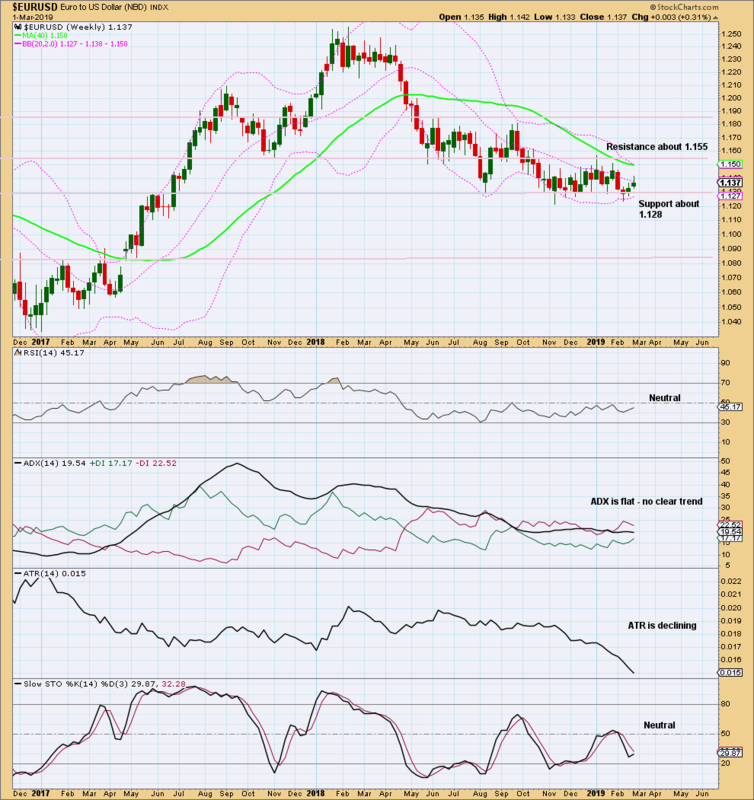 Last analysis of this pair was in July 2016. That analysis expected lower movement, which did happen in the long term, but the high was not seen until a few weeks later in August. The bigger picture expects the Euro to continue its overall downwards trajectory. A large zigzag looks like it is unfolding downwards. If the triangle labelled cycle wave b is correct, then this downwards wave cannot be anything other than a zigzag. The triangle may not be labelled as a second wave correction within an impulse, because a second wave may not subdivide with a triangle as its sole corrective structure. Cycle wave c must subdivide as a five wave structure. It looks like it is unfolding as an impulse. Primary waves 1 and 2 are complete within the impulse. The target for primary wave 3 expects it to exhibit the most common Fibonacci ratio to primary wave 1. Primary wave 3 may only subdivide as a simple impulse. 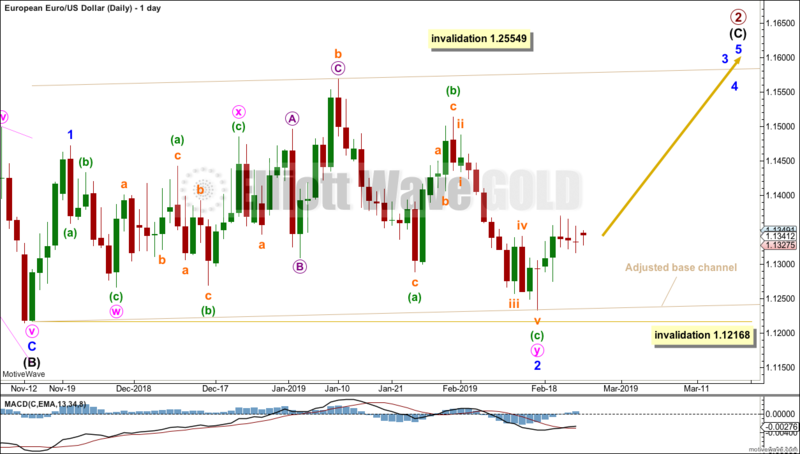 The structure of primary waves 2 and 3 can be seen on the weekly chart below. The maroon channel is drawn as a best fit, and it is important. Draw the first trend line from the end of cycle wave b to the highs within primary wave 3 (better shown on the weekly chart below). The upper edge of this channel is where price is finding strong resistance, with one overshoot for the price shock of the 9th November, 2016. Primary wave 2 subdivides as a double zigzag. The second zigzag in the double deepened the correction achieving its purpose. However, this structure has mostly a sideways look. Within intermediate wave (3), there is inadequate alternation in structure between the corrections of minor waves 2 and 4 because both subdivide as expanded flats. But there is alternation in duration and depth: minor wave 2 is deep at 0.75 and longer lasting at 20 weeks while minor wave 4 is shallow at 0.46 and more brief at 2 weeks. The alternation is within the middle: minor wave 2 has a time consuming B wave while minor wave 4 has a brief B wave. Minor wave 4 does not overlap minor wave 1 price territory. All rules are met. Intermediate wave (4) may end if price again comes up to touch the upper maroon trend line. A mid line is added that is also proving useful for temporary support and resistance. Intermediate wave (4) may end within the price territory of minor wave 4, one degree lower. Intermediate wave (4) may not move into intermediate wave (1) price territory above 1.10972. The daily chart below shows all movement from the end of intermediate wave (2). Intermediate wave (3) may be a complete impulse. Minor wave A subdivides as a three within intermediate wave (4). Minor wave B is a quick zigzag and is a 1.04 length of minor wave A, indicating a regular flat. The target for intermediate wave (4) to end may see it fall slightly short of the maroon trend line. The target expects minor wave C to exhibit an uncommon ratio between A and C waves within a regular flat. Regular flats are usually sideways structures and this one looks more like an expanded flat. This pair has been sitting along the upper range of Bollinger Bands now for several days. This is common during its trends, so this does not indicate an end to upwards movement here. The length of time is a warning though that the upwards trend is nearing its end. 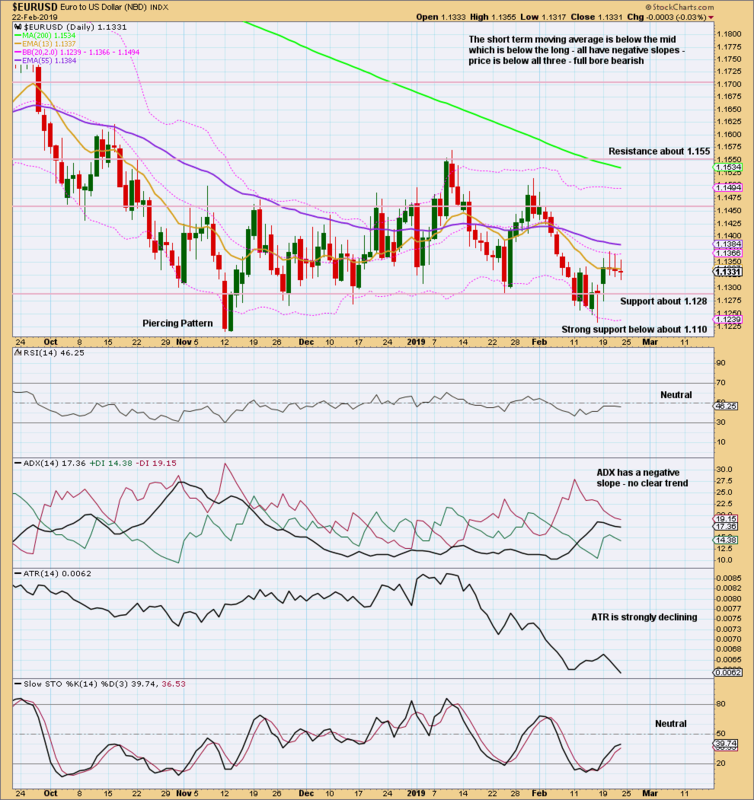 EURUSD tends to find resistance or support about the Fibonacci 13 day moving average during its trends. If a full daily candlestick prints below this line, then it would be an indication the upwards trend may be over. At this stage, there is no divergence between price and RSI at highs nor between price and Stochastics at highs. There is room for upwards movement to continue. 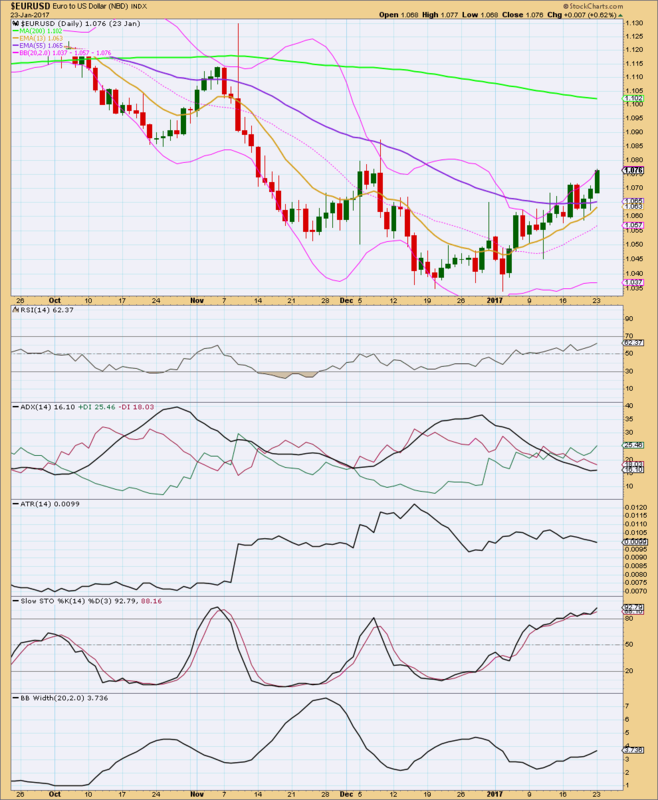 RSI is not overbought. 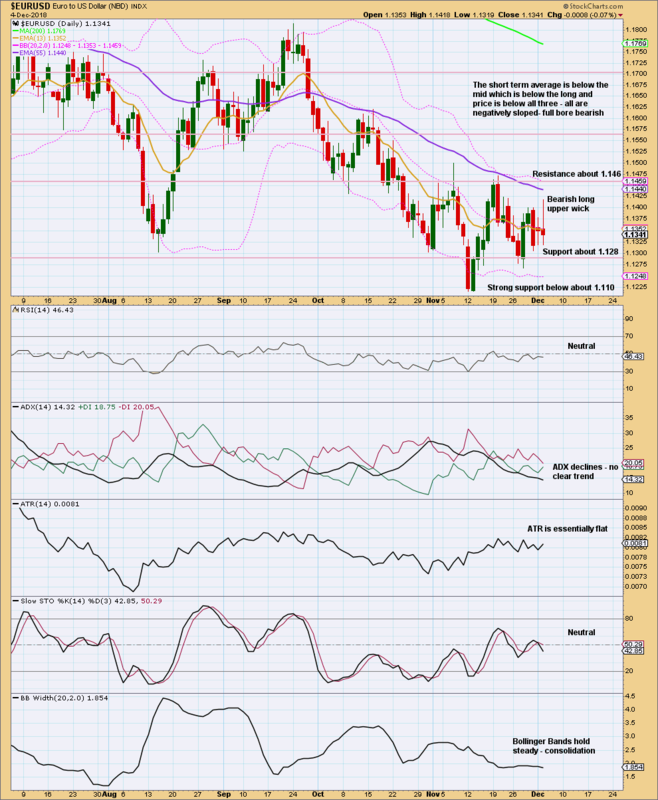 ADX today indicates an upwards trend in place: the ADX line is above 15 and rising, and the +DX line is above the -DX line. 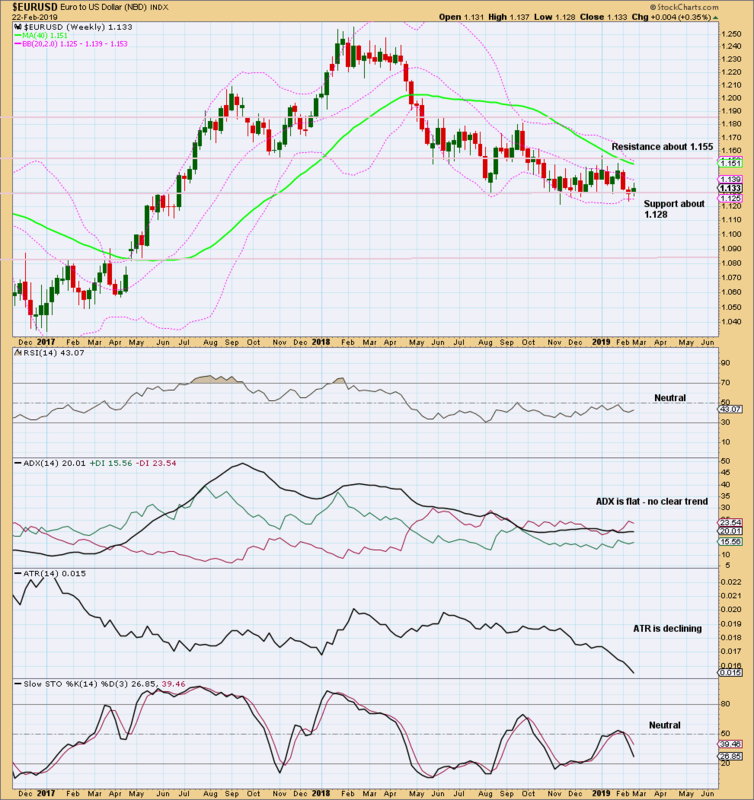 The trend is young; the ADX line is below both directional lines. ATR is flat to declining as price moves higher in choppy overlapping movement. This upwards movement looks like a counter trend movement within a larger downwards trend. 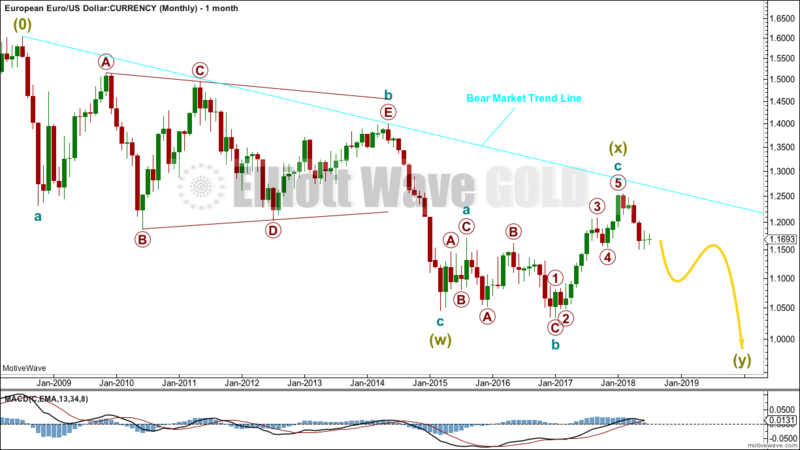 Trading advice is given below for Elliott Wave Gold members only. Members must log in to see the next section. EURUSD has a good trade set up today. 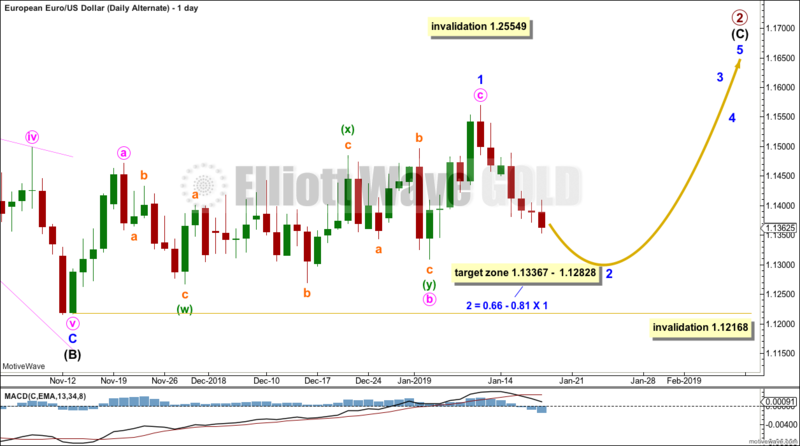 A brief Elliott wave count and technical analysis of the Euro.